Flanges constantly experience damage from corrosion or erosion due to turbulent flow, impacts with other components during construction or installation or cuts from gasket leaks. 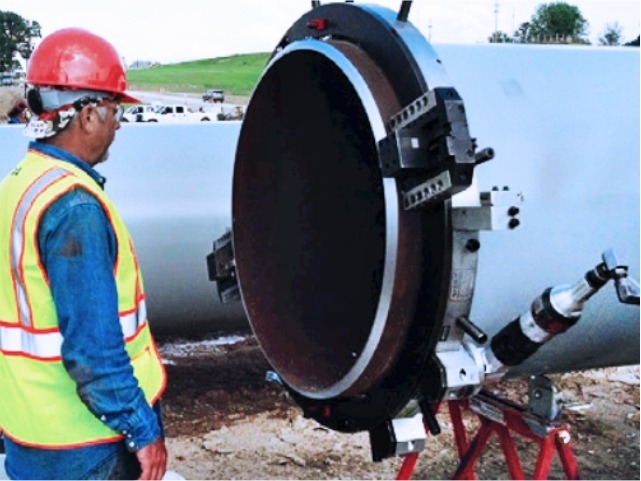 Our on-site services team specialize in the machining of hub profiles, the front and rear faces of heat exchangers, sealing surfaces of pressure vessels and boilers to name a few. Our skilled team uses rugged and innovative portable flange facers ranging from 5 to 120 inches (127 to 3048 mm) for ID, OD or Surface Mounting with the ability to reface, mill, bevel, square, counterbore or machine weld prep or seal ring profiles, as well as the ability of many to convert from single point to milling operations, making our machining services extremely versatile. Re-facing of main steam inlet flanges, Heat exchanger nozzle flange repair, Facing and beveling of pipe for sealing and weld prep, Repair of flat face, raised face and phonographic finish flanges, Repair piston rod mating flanges, Boiler feed pump flanges, Re-machining gasket seal on tube sheet, Repairing ring grooves or cutting new grooves, Plate and vessel weld prep, Re-facing of ship hatch sealing surfaces, Re-machining of rotary crane bearing surfaces, Re-facing of main steam inlet flanges, Re-surfacing of large pump base housings, Re-facing of valve flanges, Heat exchanger repair, Wind tower section flange milling, Ship thruster mount facing, milling and drilling. Team of technically qualified personnel to conduct application study at the customer’s premise and suggest the best portable machining solution.